At Browserling we're building a network of online tools websites. Each site in the network focuses on one and only one tool category. Each tool does one and only one thing. The first eight websites in the network are Online CSV Tools, which is all about working with Comma Separated Values files, Online TSV Tools, which is all about working with Tab Separated Values files, Online JSON Tools, which is all about working with JSON data, Online XML Tools, which is all about working with XML documents, Online YAML Tools, which is all about working with YAML configs, Online STRING Tools, which is all about working with strings, Online RANDOM Tools, which is all about doing random things, Online BINARY Tools, which is all about working with binary zeros and ones. Today we're releasing the ninth site. The ninth site in our network is Online PNG Tools. 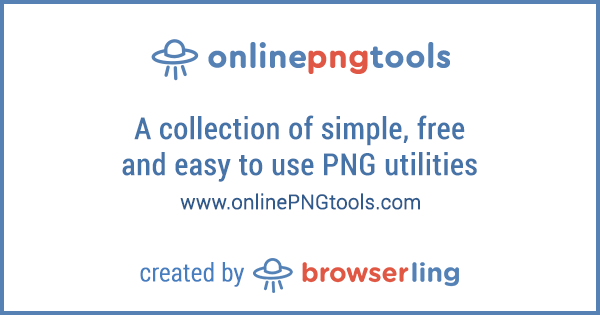 Online PNG Tools is a collection of simple, free and easy to use utilities for working with PNG images. There are no ads, popups or other garbage. Just PNG utilities that work in your browser. Load a PNG and instantly get result. The next few sites are onlineIMAGEtools, onlineHASHtools, onlineBROWSERtools, onlineJPGtools, onlinePDFtools, onlineCRYPTOtools, onlineAUDIOtools, onlineCSStools, onlineJStools, and then 15 more. If you like what I'm doing you can subscribe to my blog and/or follow me on twitter and/or follow browserling on twitter and/or do nothing. Thanks for reading my post. If you enjoyed it and would like to receive my posts automatically, you can subscribe to new posts via rss feed or email. Secret message: Use coupon code JELLYLING to get a discount at my company Browserling!